Exercise is another aspect of preventative geriatric care for your dog. You should definitely keep your dog going as he gets older. If he is cooped up or kept lying down, his body will deteriorate much more quickly. Jogging with your arthritic dog may not be appropriate, but swimming and other low-impact activities are great for dogs with joint pain and arthritis. See if there is an indoor dog swimming pool near you. My mother taught her dogs to swim in such a facility. It had a heated indoor swimming pool for dogs. In Wales we have outdoor swimming ponds and a swimming trench suitable for dogs. They can touch the floor in the ponds but the trench is much deeper and should only be used by dogs that can actually swim as they have to swim to the end with a ramped exit - the sides are too steep to get out of. As the water is very cold in winter, this facility is best reserved for summer. 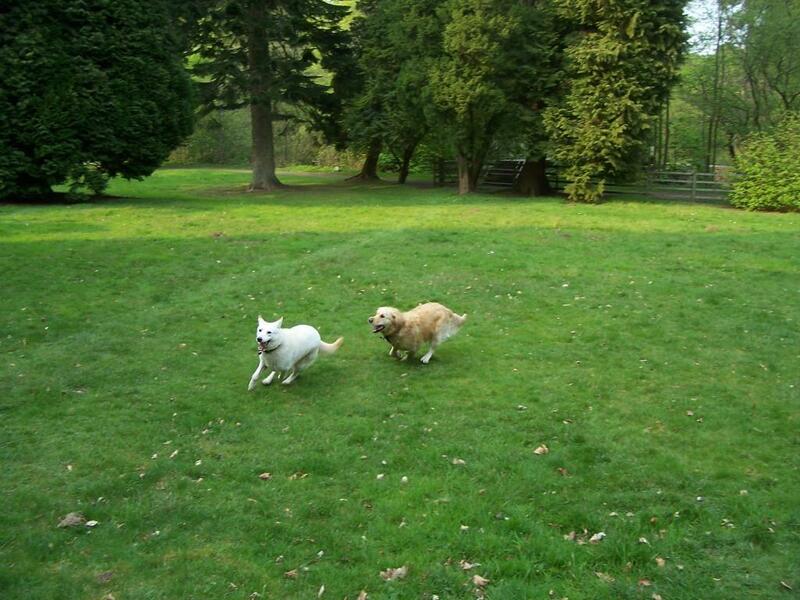 Craig y Nos also has plenty of country park and open spaces and fields to run in, so your dog will get plenty of exercise during your stay at our Dog friendly hotel. Keeping your dog active mentally and physically helps your dog stay in top condition. In the recent past, acts of benevolence and empathy were solely a human domain. People instinctively channeled empathy, sympathy and love towards fellow humans as opposed to animals. However, this seems to be slowly changing as humans accord the same empathy and love to various domestic animals. Taking care of our dogs has become more of a responsibility than a duty. People have now extended the human empathy which is generally accorded fellow humans to animals and other non-human entities. The effect of this is that the world has become a better place where both humans and their pets co-exist harmoniously. Taking care of dogs is increasingly becoming an important undertaking. The well-being of our dogs is something that we cannot take for granted. For many years, focus has been shifted to how to take care of dogs generally. However, little attention has been given to pregnant dogs and how to take care of them. Just like humans, pregnant dogs also require attention, proper hygiene and a good and well balanced diet. Having a pregnant dog at home requires that you accord it proper attention. This can be achieved by ensuring that the dog takes a proper diet, stays in a warm and cozy place and that it's as comfortable as possible. A pregnant dog should not be subjected to strenuous exercises, poor hygiene or poor diet. Humans require eating well in order to sustain their unborn babies. The same applies to dogs when they are pregnant. It's instructive that you consult your vet on the proper diet to give your dog during pregnancy. The diet should be one that provides your dog with the necessary nutrients, energy. Choosing a bed for your pregnant dog should also be done with utmost care. The comfort of your dog during pregnancy is very essential and therefore the need to ensure that you settle on a bed that is both cozy and warm. The effect of this is that it provides your dog with a proper resting place and makes the pregnancy period manageable. Nutritional food comes in handy during a dog's pregnancy. Ensuring that your dog has the necessary supplements is quite effective during its pregnancy. However, you need to provide it with food and supplements that are approved by a qualified vet. A dog can experience difficulty during pregnancy just as humans do. It's therefore important that you schedule various vet visits to keep the pregnancy in check and find out whether it's going on well. The overall health of your dog when pregnant is of paramount importance. You should therefore purpose to ensure that your pregnant dog stays away from other dogs to prevent it from getting any disease. Exercises are also of paramount importance. You should keep your dog in proper shape by taking it for walks in the park. However, exercises accorded to a pregnant dog should not be strenuous as this might prove to be hazardous to the well-being of the unborn puppies. All in all, proper health for your pregnant dog is of paramount importance. You need to be conversant with a number of tips on how you can take care of your dog throughout its pregnancy.